James Corner Field Operations, the landscaping firm behind New York City’s High Line, is turning a one-mile section of Chesapeake and Ohio (C&O) Canal in Georgetown into a new greenspace. According to Curbed D.C., the firm has released new renderings that offer a glimpse into the redevelopment plan. 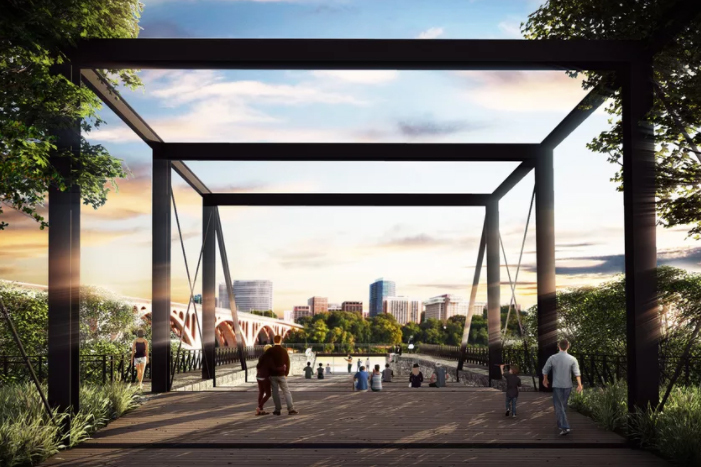 The park will have a new visitor center, educational exhibits, a fishing pier, nature classrooms, and new bridges to Rock Creek park, according to Curbed D.C. Plans also call for an aqueduct that will connect visitors to the nearby boathouse, a new 34th Street bridge with an elevator and ramps, a garden lounge, grotto benches, a boardwalk, sky deck, and a resurfaced square. The redevelopment will also include a regraded towpath, outdoor tables and seating areas, and public restroom renovations, per Urban Turf. According to the National Park Service, the purpose of the redevelopment is to address mobility and safety concerns of the area, add more amenities for visitors, and create a more engaging experience with educational and cultural programming. Last week was just the first of many opportunities for D.C. residents to see these new designs. The National Park Service has invited members of the community to submit their feedback until Dec. 11.